Ideally located within 2 to 5 minutes' walk to fabulous beaches, restaurants, shops, excursion agencies and all amenities, this spacious 1 bedroom apartment is fully air-conditioned and tastefully furnished. There is a double-bed in the bedroom and a "clic clac" sofa bed in the living room. The apartment benefits from unlimited fibre optic wifi as well as all mod cons, including a digital safe, a flat screen television and a DVD/CD player. Bed linen and bathroom towels are provided, and your bed will be made prior to your arrival. The grounds of this private residence boast tropical gardens and a large, newly refurbished swimming pool with the latest ecological water treatment system free of salt and chlorine. On request, we will arrange for free parking at the residence. A concierge resides in the lodge at the entrance to the residence. Included in the price, our lovely English and French speaking housekeeper, Marceline, provides a daily cleaning service (Monday to Friday, excluding bank holidays). Marceline will welcome you on arrival, show you around, give you the keys and ensure that your stay is comfortable and enjoyable. Books, beach toys, a travel cot and a highchair are available on request. - Half day/full day deep sea fishing (marlin, tuna and other species). - L'Aventure du Sucre, an old sugar mill converted into a stimulating museum retracing the history of Mauritius is also 15 to 20 minutes drive away. - The Botanical Garden of Pamplemousses is world-renowned. The gardens are spectacular with an enormous variety of tropical plant species. There are also giant indigenous tortoises and a small zoo. It is about 20 minutes' drive away. - Visit the restored, grand colonial mansion of Chateau de la Bourdonnais, its lush gardens, old orchards and distillery where you will learn about the old production techniques of agricultural rum. It is about 20 minutes away. - For another journey into the past, we suggest you visit La Demeure St. Antoine in Goodlands. It is an old mansion filled with the elegance of a bygone colonial era. It's also a perfect place to have aperitif in the gardens followed by a lovely meal on the veranda facing the beautiful gardens. Only about 20 minutes drive away. Pereybere lies on the north/north west coast, which is the most sheltered from winds. It enjoys a clement local climate making it a great all-year-round destination. - Spacious living/dining room area for a 1 bedroom apartment. - The apartment is air-conditioned throughout: the living/dining room as well as the bedroom. - The living/dining room has a "Clic Clac" sofabed. - Good quality bed linen provided and beds made prior to your arrival. Towels for indoor use also provided. - The residence boasts one of the larger swimming pools on the island for a private residence. It has recently been refurbished with a chemical-free "Oxymatic" cleaning system. - Our lovely housekeeper, Marceline, who welcomes our guests on arrival and cleans the apartment 5 times a week (included in our advertised nightly price) is always delighted to prepare on demand a delicious traditional Mauritian meal for a modest fee (250 - 350 Rupees per person per meal) . She can also take care of your laundry (250 Rupees per load, washed and ironed). - The residence is on the beach side of the coastal road running through Pereybère. There are no roads to cross to walk to an array of wonderful beaches, 3 to 5 minutes walk from the apartment. - The apartment is only 2 to 3 minutes walk from a very well-stocked supermarket, with also has a bakery section. - All amenities: a bus stop, taxi stand, restaurants, car rental agencies, diving centers and tour agencies are between 1 to 5 minutes walk from the apartment. - If required, we can organise your airport taxi transfers through a reliable English and French speaking driver (1,700 Rupees per transfer). - During your stay, the taxi service is also available for a wide variety of bespoke half and full day excursions. Good quality bedding and the bed is made prior to your arrival. Bathroom towels provided but please note that they are not for beach use. We do not provide towels for beach use. Spacious air conditioned living/dining room with "Clic Clac" sofa bed and door leading to the balcony. Crockery, pots and pans and kitchen utensils provided. The balcony leading from the living/dining area, features a square wrought iron table with 2 chairs. We also provide 2 foldable beach chairs, which you may use by the pool or at the beach. Just wanted to thank you and to let you know that we had a wonderful time staying in your apartment and visiting Mauritius. We loved the island and the people were all very friendly. Was lovely to meet your parents who were very friendly and helpful. Also Marcelline who cleaned the apartment. The apartment was perfect! Perfectly situated and had everything that we needed for our stay. We wouldn't hesitate to recommend to family and friends. A good rental for two people and enough space for four if you don’t mind preparing a sofa bed for the other two. Positives: A great position: near the supermarket, car rental office, bus stop and about 4 minutes’ walk to the beach. Handy to have a pool for days when it’s too windy for the beach, although there is some road noise but you’ll get used to it. There are plenty of utensils, crockery and bowls, etc. in the kitchen. Spare linen and a linen basket is provided, so just wash what you’ve used. The washing machine plays a little tune when it’s finished its cycle! A drying rack is provided. The air con works well. There is an alarm so you can feel safe. The maid is very helpful and friendly. Our taxi transfer was as arranged. Negatives: A drawback is that there is no hot water in the bathroom basin or the kitchen sink so be prepared to boil the kettle. It would be helpful if this was pointed out. The underground parking that comes off the little lane is quite tight so you have to be good at manoeuvring, so hire a small car. There are usually some cars parked at the top of the lane, so make sure there’s nothing coming before you turn down there from the main road. Extra information: The cooker is gas, including the oven and matches are provided (standard size not long ones, which seem to be impossible to find in the shops!). We are really happy to write this review about the apartment and Mauritius as well. First of all if you are looking for a destination with great weather, beautiful ocean and amazing people Mauritius is a right place for you! We always hoped that such a place still exist in the world where people great you with a smile in their face only because they pass around you! We really loved that! As for the Pereybere it is a nice holiday village with good restaurants serving thai, chinese and creole food, several bars, internet cafes, travel agencies, ATM machines, some boutiques and big supermarket called "Winners" where you can buy really everything you might need. It is ideally located about 100 meters from the apartment (it is great for buying the freshly baked baguette every morning :) Pereybere is also known for its beautiful turquoise lagoon where you can swim almost like in a pool. We have a small baby so we couldn´t think of a better place. Yes it can get a bit crowded during the weekends but it is nice to see how locals spend their weekends by the sea. On the other side of the apartment there is a loooong stretch of so called private beaches where you can relax without the crowds. Apartment is equipped with the lightweight sun chairs and umbrella which you can take along with you to the beach. As for the apartment itself... it is a nice, bright and very good located holiday apartment where you will find everything you might need for the selfcatering vacation. There is also a babycot and a highchair. Everyday cleaning is a bonus that we really appriciated and you are also in touch with lovely always smiling housekeeper Marceline who is there to help you with anything you might need. And at the end we want to thank to the owners Sandra and Mark who were very helpful arranging the things around apartment. We were lucky enought to meet them and their parents personally. They all are such a nice people who provided us with plenty of information about the island and helped us with everything we needed during our one month long stay and also helped a lot when our baby was ill... they made our stay really amazing and unforgettable experience! And when they left back to Europe our baby was standing everyday infront of their door saying "Where is Gerome and Silvia?" :))) it was so cute...So once again thank you and we really hope so much to meet you all again in such a beautiful place like Mauritius definetely is! We would like to let you know we had a very relaxing enjoyable holiday. The was excellent. We used the "private" beach the mostly, as it is only 5 minutes walk and the snorkling for tropical fish was what we both were looking forward to. We found the trip (Rs400) to the South West showed us most of the Island and the bus rides into Port Louis(Rs32) as good as any fairground ride! Marcella's meal was delicious and plenty of it. There are lots of restaurants within 10 min walk or Winners supermarket is only 2 mins round the corner. 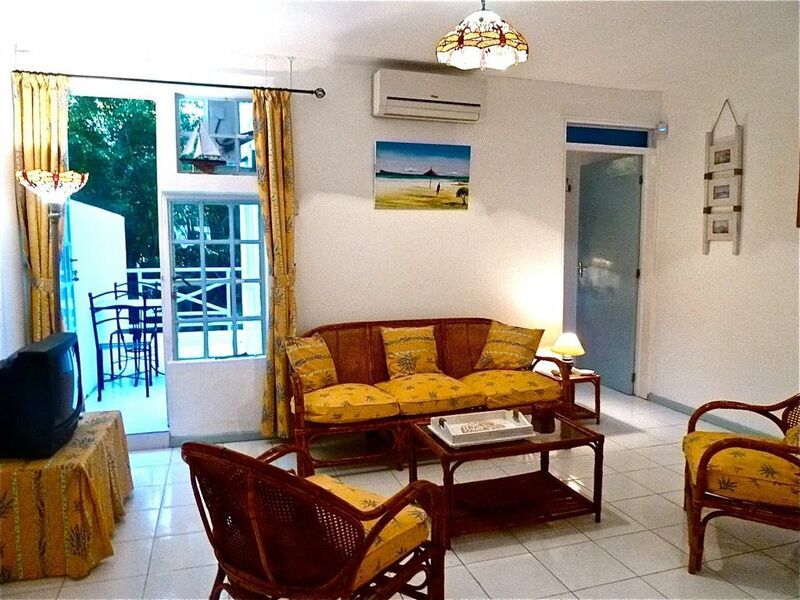 First of all thank you so much for really a great holiday.The photos don't do this apartment justice.. What a lovely spacious apartment, furnished appropriately for holidaymakers wanting a self catering style of holiday.,which is the only way to enjoy Mauritius :-) . The supermarket is around the corner and there are 2 fruit markets just as close making shopping so convenient . We enjoyed amazing food for breakfast every morning and had lunch and dinner a couple of times in the apartment. The place was kept immaculate by Marceline who also makes a mean local curry upon request for dinner - for a nothing fee. We spent every day on the beach and there was a cupboard full of beach towels, and beach chairs and mats to use which we really appreciated. The coffee perculator was my best friend and the local supermarket stocked my favourite coffee :-) . The location was brilliant - 5mins to Grand Baie by bus which stopped outside the door, and cost next to nothing. Cote d Azur private beach was a two minute walk and we spent every other day here, while Pereybere's main beach, a 3min walk was a lovely beach style lagoon , and a sunbed and umbrella could be hired out for the whole day, and Cafe Perybere and the local Food Stand and Icecream stand was well visited by us. We highly recommend hiring a scooter and going around the island - we had a free tourist map to use and it was easy to get around. Swimming with Dolphins was the highlight of our trip , which Nanda, who picked us up from the airport, combined it with a mini tour around Mauritus for a great price. Nanda is the man to talk to about tours, and if you like seafood and don't mind basic restaurant surroundings then Nanda's Uncles Rest in Grand Baie is the one to visit . The Sailing trip out to Flat Island was also another highlight with the snorkleing and the onboard seafood BBQ. We could go on and on about how amazing Mauritus was and staying in such a fresh, spacious and well equipped apartment for two weeks just made the holiday a real island style living scenario. We had an amazing time and ( fingers crossed) hope to be coming back next year. It really was a wonderful and truly magic holiday and would recommend it to families, couples and friends. We cannot recommend Mauritius more highly! A more colourful and vibrant place would be difficult to imagine. The people are very friendly, and the island feels very safe. We had a wonderfully warm welcome, first from Nanda who drove us safely across the island from the airport, then from the lovely Marceline, who couldn't have been more friendly and helpful, and subsequently from Sandra's very kind parents who gave us lots of useful advice. The apartment is situated in Pereybere which is a pleasantly lively place with a variety of reasonably priced restaurants. The new 'Winners' supermarket is conveniently close and well stocked. The apartment itself is bright, and cool (due to the air conditioning). The furniture is quite basic, but we found the washing machine very useful. Marceline had thoughtfully furnished the fridge with a few items, so our first breakfast was provided for. We didn't often feel 'ripped off' in Mauritius, but avoid the loungers and parasols on the beach for which they wanted to charge us 800 rupees. Do make sure you find time to visit the south of the island which is also very beautiful but quite different to the north. All in all it was a great holiday! Don't miss out!